Speeding traffic is a common concern for many residents of the village, and is typically among the top 5 issues that parishioners would like the council to prioritise for action. This is not just true of Ruyton XI Towns, but is typical of many villages across Shropshire. The Parish Council has installed gates at the western end of the village to remind motorists that they are entering a residential area with a 30mph speed limit, which of course reduces to 20mph in the vicinity of the school. 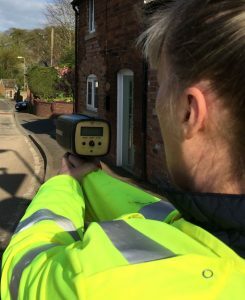 In addition to this, a Community Speedwatch team has been established, with a very simple aim – to reduce the speed of vehicles through the village. Although the details of speeding vehicles are recorded and shared with the police, the primary objective is not punishment, but to raise awareness of and reinforce the speed limits, and increase driver’s awareness of their speed. The team is formed of trained volunteers, and they will be undertaking speed monitoring sessions in the coming weeks and beyond. The sessions will take place at different days and times in order to raise awareness among different driver groups, and at various locations throughout the village. More volunteers are needed to sustain this effort, and the clue is in the name – this is for the community, by the community. If you are concerned about traffic speeds within Ruyton XI Towns, and would like to be part of the solution, please contact Councillor Bob Edwards or Councillor Scott Denyer for more information. This is not a Parish Council scheme, although a number of councillors participate – but the more volunteers we have from the wider community, the better!